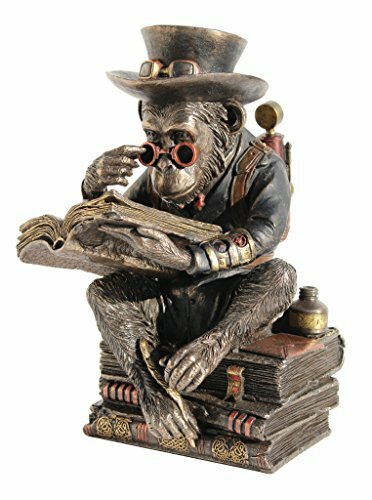 This cool Steampunk style Chimpanzee Scholar has a hand-painted metallic bronzer and copper finish. Steampunk is a subgenre of science fiction or science fantasy that incorporates technology and aesthetic designs inspired by 19th-century industrial steam-powered machinery. Although its literary origins are sometimes associated with the cyberpunk genre, steampunk works are often set in an alternative history of the 19th century's British Victorian era or American "Wild West", in a post-apocalyptic future during which steam power has maintained mainstream usage, or in a fantasy world that similarly employs steam power. Steampunk may, therefore, be described as neo-Victorian. Steampunk perhaps most recognizably features anachronistic technologies or retro-futuristic inventions as people in the 19th century might have envisioned them, and is likewise rooted in the era's perspective on fashion, culture, architectural style, and art. Such technology may include fictional machines like those found in the works of H. G. Wells and Jules Verne, or the modern authors Philip Pullman, Scott Westerfeld, Stephen Hunt and China Miéville. Artistically sculpted, very detailed and high quality.